Can I just say that I love summer? Summer allows me to refill the pantry with goodies to tide us over until next summer. Canned goods, frozen fruit, jam. Yum. And, actually, our goodies usually tide us over for more than one summer. If I’m going to go through the trouble of canning I’m going to do enough to last at least two years. Because, who am I kidding, it’s a lot of work. Lucky for me, the husband is willing to help. That’s partly because he’s just a helpful fellow and largely because he knows there’s nothing better than home-canned goods. 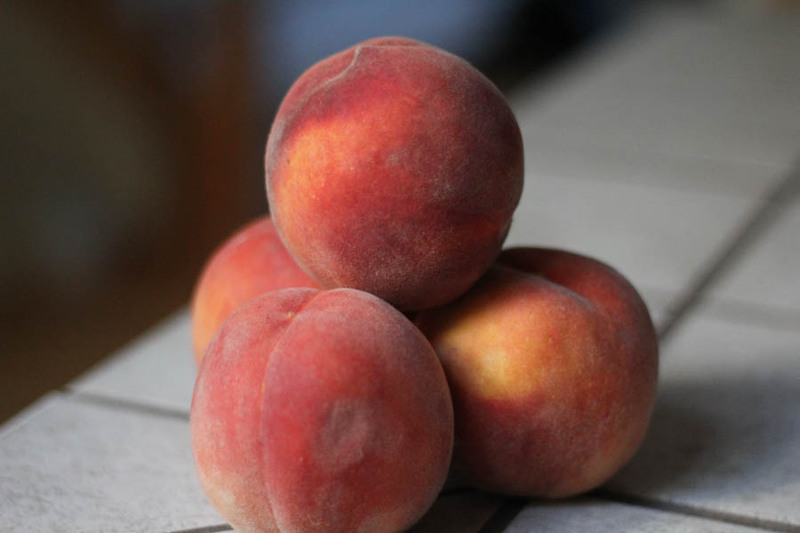 The subject for this weekend: peaches. Just across the mountains in Central Washington they grow all sorts of delights. Peaches, pears, plums, corn, tomatoes, onions, nectarines. You get the idea. So, we’re able to get fresh-from-the-farm fruit and vegetables from a number of local produce stands. I know, it’s a tough life. 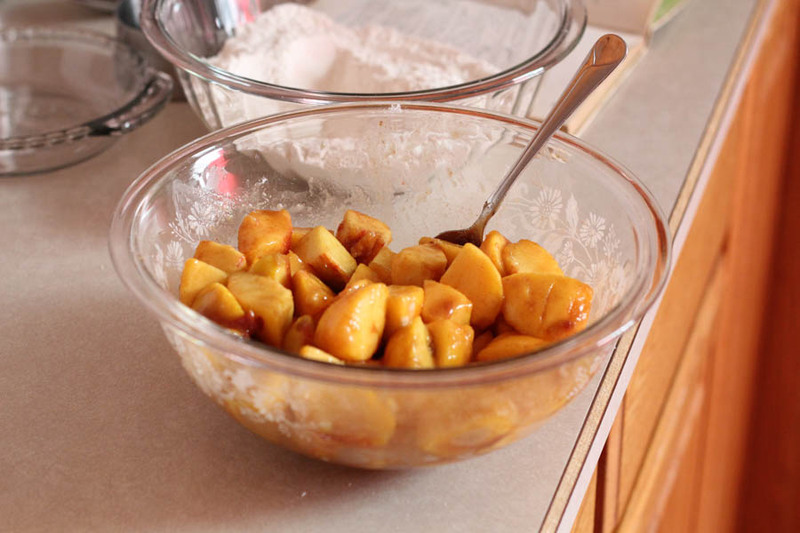 I’m not sure how many pounds of peaches we started with…probably 18-20. We started by dipping them in hot water for about 15 seconds to loosen the skin. Otherwise you’re peeling by hand. That’s no fun. A little hot water followed by a cold water bath and the skin slides right off. The husband worked on that while I prepped jars, heated the syrup (I use a light syrup made of sugar and water) and then crammed the fruit in the jars. 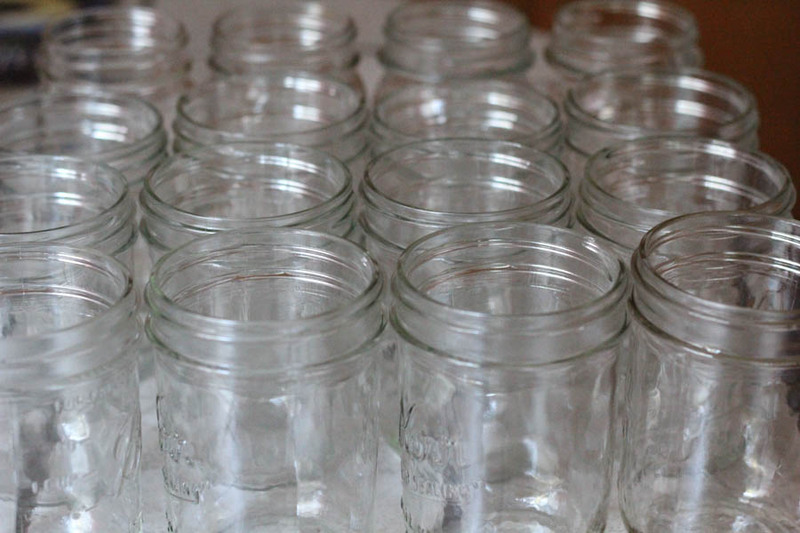 I was lucky enough to be the recipient of a dozen wide-mouthed pint jars last year. A friend no longer cans and was getting rid of her stuff. I kind of like the wide-mouthed jars because they’re easier to fit the fruit into. But, I quickly ran out and moved to narrow-mouthed pints. Shrug. It is what it is. I work with a half dozen jars at a time, as that’s how many fit into my canner. I may fill the jars with fruit, but I don’t add the syrup or put the lids on until I’m ready to process them. I think they tend to process better if the jar is warm when it goes into the canner. Maybe it’s because the water temperature doesn’t drop as much. I don’t know. A lot of what I know I simply know because it’s what my Mom and Grandma told me. I do what they do. So, you have the jar filled with fruit and syrup. Next step is to top it with a lid and a rim. To ensure a good seal I boil the lids in a small saucepan of water. It softens the rubber ring on the lid. Again, do I know for sure this ensures a good seal?No. But Mom and Grandma boil the lids. I just read the lid box. It instructs you to simmer the lids. So, we’re all just following instructions. No one’s gone off half-cocked here. Lids on? Add the rim. Tighten, but not too much. The best canning possession I own is a jar gripper. I’m too lazy to go take a picture, so if you don’t know what I’m talking about check it our here at Amazon. 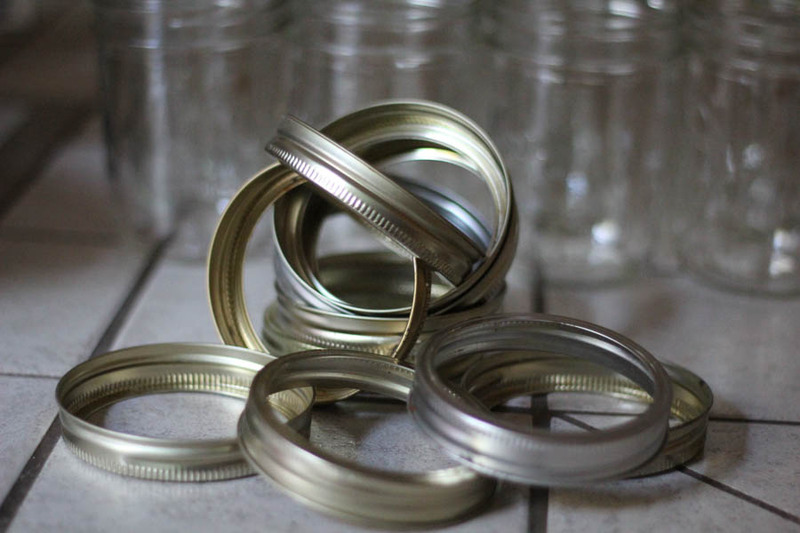 As we worked the husband and I found ourselves talking about canning from our childhoods. He doesn’t remember his Mom canning anything but cherries. He says he knows there was some expectation that he participate in that process, but he doesn’t remember what he was supposed to do and said that he thinks he failed. My family canned about everything that came out of our garden and then some. I don’t recall being very involved in the process. I guess that makes sense. Hot water baths, hot syrup, sharp knives…not something you’d have your kid involved in. I do remember snapping beans in the basement of Grandpa & Grandma’s house. And I remember trying (on multiple occasions) to either come into or out of the house from the garage only to hear Mom or Grandma yell, “Close that door, you’ll create a draft!” Mom says that the seals on lids have greatly improved and that there was a much greater risk of jars not sealing back in the day. I have a lot of memories of being around canning. The sharp smell of vinegar, crocks of pickles and cabbage percolating in Grandpa & Grandma’s storeroom. The stench of tuna (which was always canned outside because it stinks to high-heaven). Jars and jars of pickles and tomatoes and tuna and peaches and pears lined up in our storeroom and in Grandpa & Grandma’s storeroom. Good memories there. 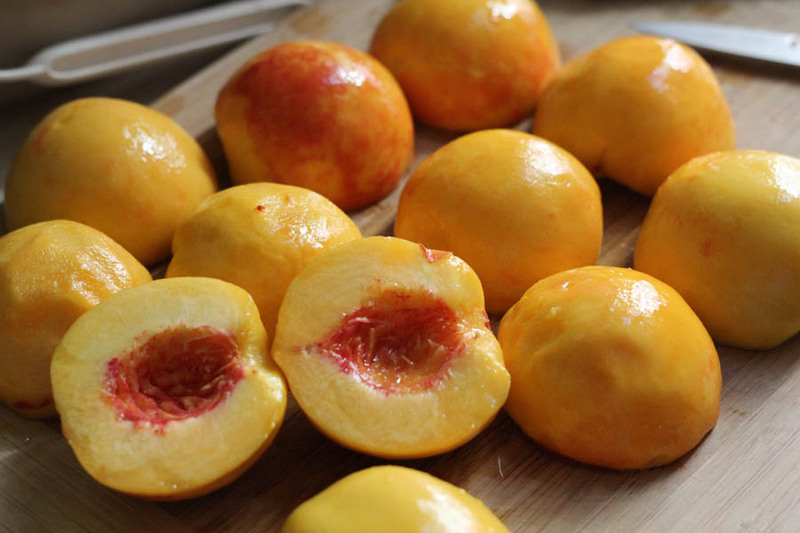 Back to peaches, which require a 25 minute processing time. I usually clean up and prep the next batch while waiting. 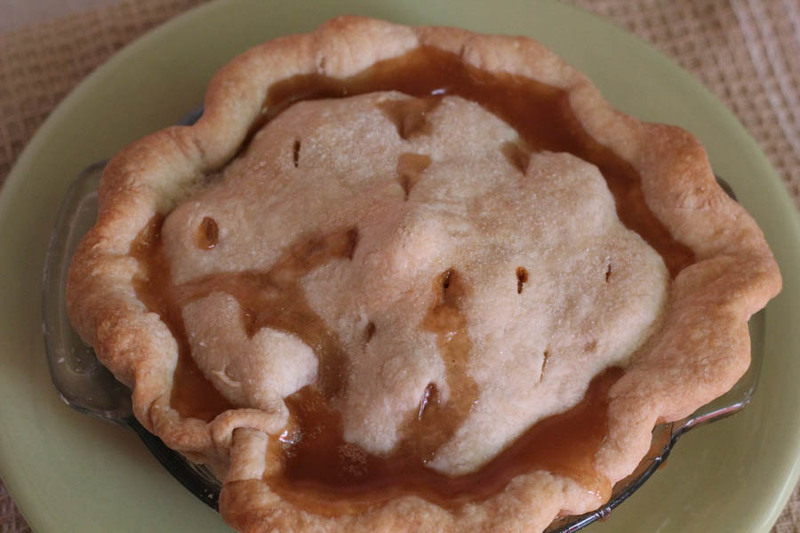 However, today the husband did the bulk of the clean-up, so I turned my attention to….pie. Remember the cute little pie pans I bought last time I went to Crate and Barrel? I tried them out today. They worked beautifully. I also discussed the “secrets” of pie in this previous post, so I’m not going to go into detail today. Just be bold, slap that pie together. There was a little bit of juggling going on while I finished putting together the pies and switched out the canner one final time. 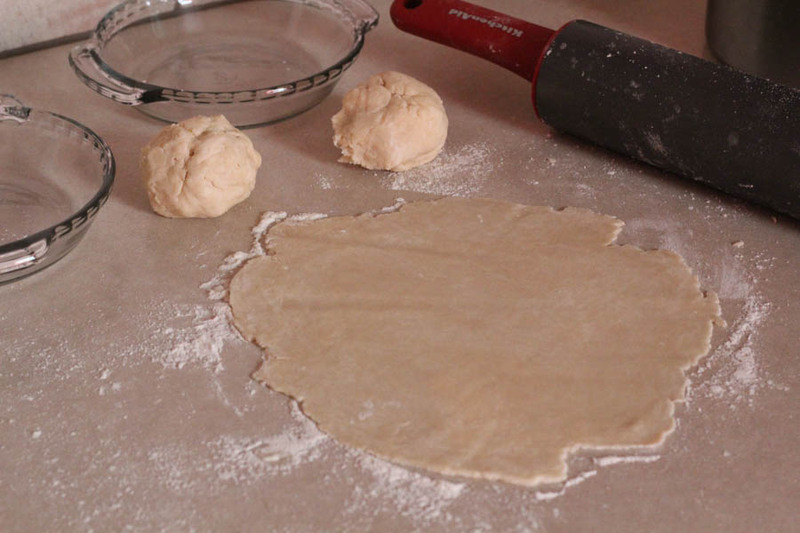 Soon, the smell of fresh-baked pie wafted through the house. There’s nothing like it. Yankee Candle has nothing on my fresh-baked pie smell! 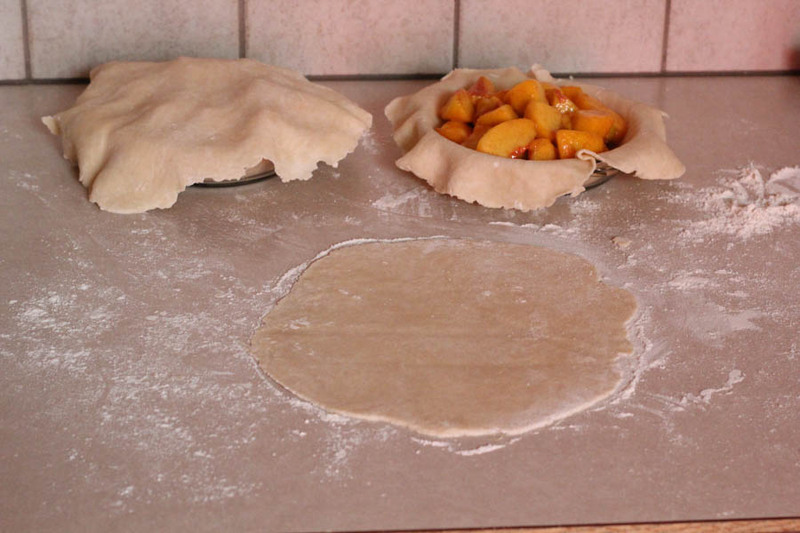 The pies came out of the oven, the last of the peaches out of the canner and final clean-up done. Sigh. I feel so accomplished. Now I just have to deal with that post-processing fear that some won’t seal. I hate it when that happens. I’ve not heard many “pops” (often you can hear a jar seal because it emits a sharp pop), but it’s also quite warm today. At least that’s what I’m telling myself. Please, please let them all seal the first time around. Wanna come over for pie? Love love. Second best piece of equipment after the jar grabber is the magnetic thingy to pull the lids out of boiling water. Like hiking poles, I did without, then wondered what the heck took me so long to get with the program! 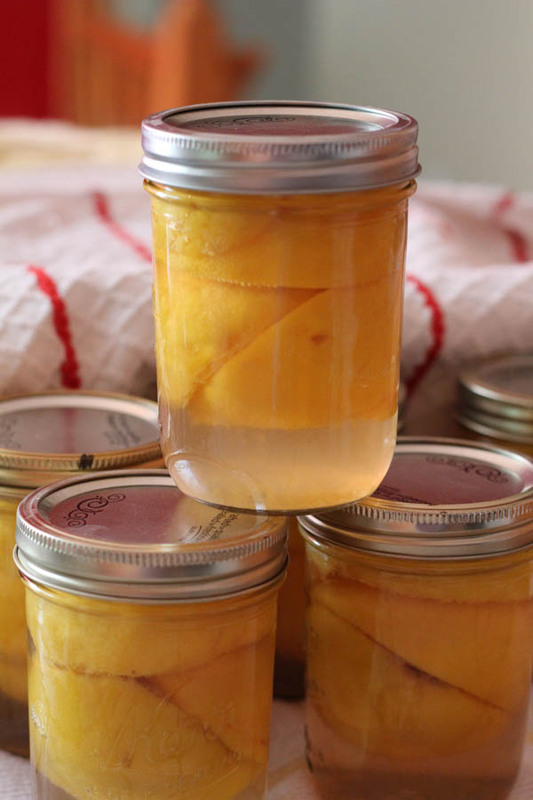 I make peach and orange marmalade. It’s so popular among our family that I always have to make two batches because they want all want a jar. 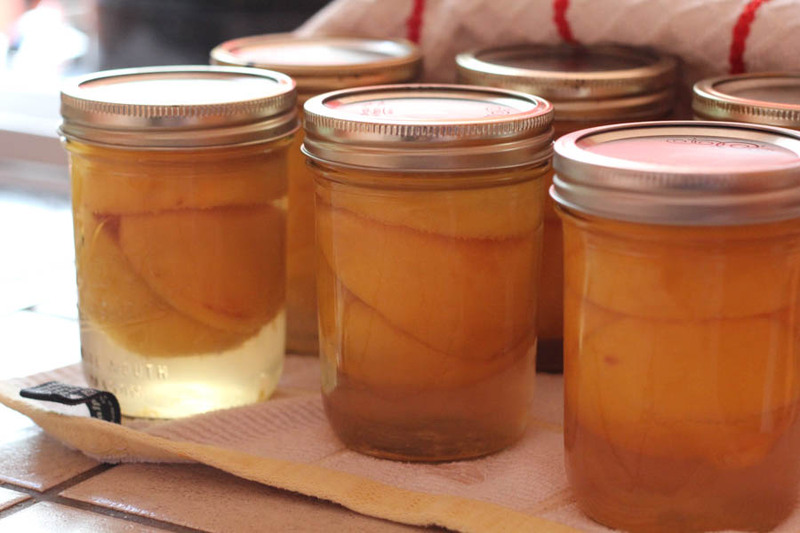 But you’ve inspired me to do some peach preserves as well. I froze peaches last year and they’re not the same. 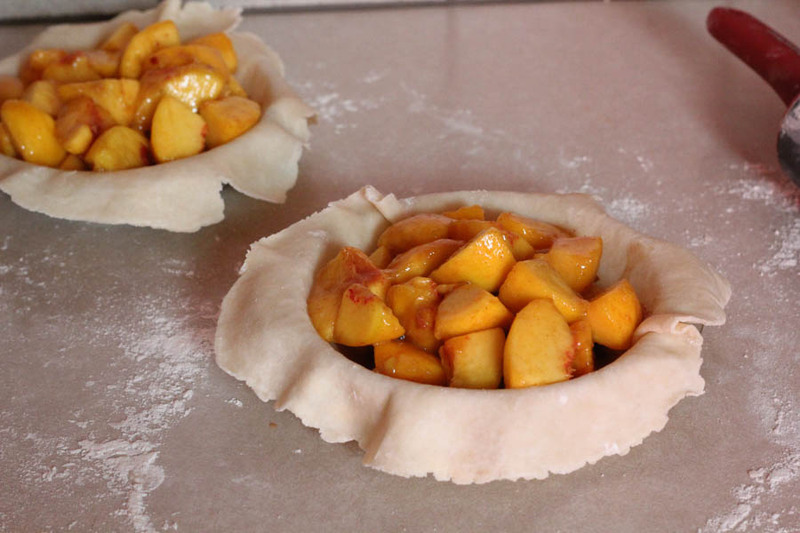 And, a couple of peach pies sound yummy. My pleasure! 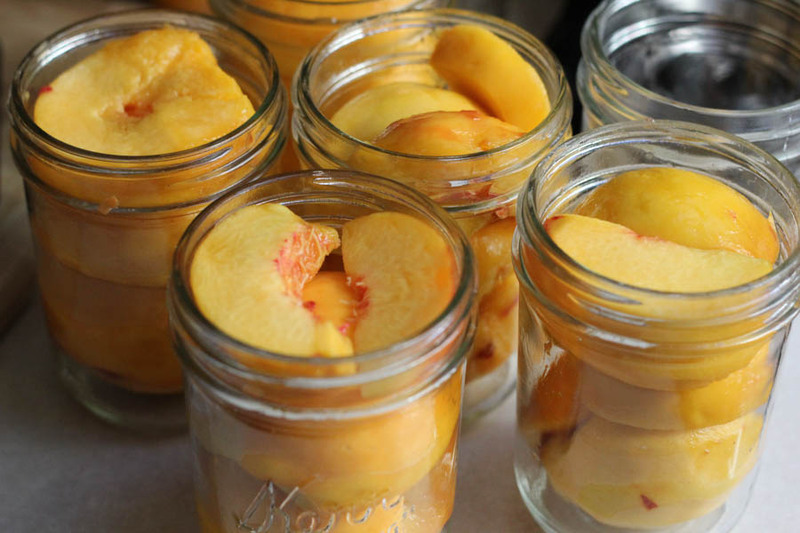 Peach and orange marmalade sounds wonderful! I’ll post some photos after I make my 2015 batch/s. I use the Certo recipe. Great blog. I use certo for my blueberry freezer jam. Strawberry and raspberry I use MCP. I don’t do any cooked jams…to much work! Hooray for you and your lovely peaches! Well done. Many months of enjoyment right there.